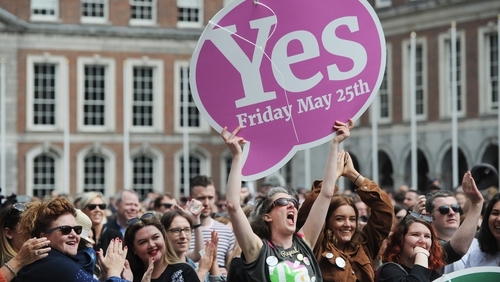 The Eighth Amendment has been repealed after President Michael D Higgins signed the Thirty-Sixth Amendment of the Constitution Bill 2018. It comes after Taoiseach Leo Varadkar told the Dáil earlier today that legislation to facilitate abortion following the Referendum on the Eighth Amendment would be introduced during the first week in October. Mr Varadkar said the timeline would facilitate services being in place in the new year. The referendum, which was held in May, say a resounding vote to remove the amendment by a majority of 706,349 votes. The Cabinet met this morning ahead of the return of the Dáil following the summer recess. TDs face into a busy few weeks with the Budget, the Presidential Election and a review of the confidence and supply deal with Fianna Fáil around the corner. TDs also debated the proposed closures of 159 post offices following a deal between An Post and the Irish Postmasters' Union. Separately, Tánaiste Simon Coveney sought Cabinet approval to recruit the first 450 customs and veterinary inspectors as part of the preparations for Brexit. The Government has said more than 1,000 customs, technical, veterinary and food inspectors would be recruited to prepare ports and airports for Brexit. Mr Coveney also outlined plans for a Brexit information campaign and public meetings next month. Minister for Agriculture Michael Creed has said contingency plans were being prepared in the event that the UK "crash-out" of the EU in March next year. Speaking on RTÉ's Morning Ireland, Mr Creed said a memo would also be brought to Cabinet that deals with the conclusion of the withdrawal agreement and a transition period should there be agreement. Mr Creed said the Government had in "fine and granular detail" a plan to deal with all outcomes of Brexit. He said work had been undertaken in preparing the agri-food industry for all possible scenarios. Meanwhile, Minister for Justice Charlie Flanagan briefed his ministerial colleagues on the report of the Commission on the Future of Policing, which was published this afternoon. The commission has been examining the structure and management of An Garda Síochána as well as the culture and oversight of policing. Commission chairperson Kathleen O'Toole previously stated that it would be the most ambitious review of policing since the foundation of the State. The report recommends new oversight structures for the force, as well as a a new approach to community policing.